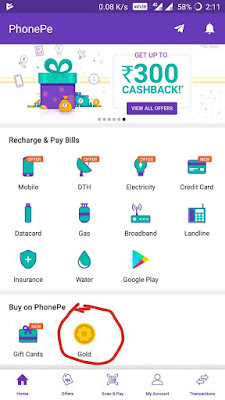 How To Transfer PhonePe Cashback into Bank- As you may know phonepe has introduced gold in their platform. Just update the app if you’re not getting the option. For the first gold purchase, they’re offering flat Rs.100 cashback on a minimum purchase of Rs 1000. You can also use your wallet balance to buy. 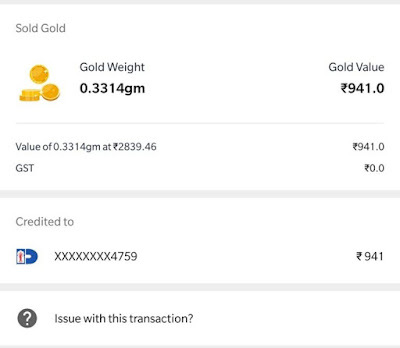 So now you can convert wallet cashback to buy the gold. 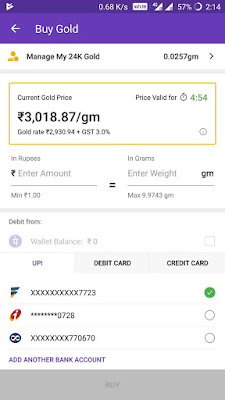 How To Get Rs.100 Cashback On 1st Gold Purchase on PhonePe? 2.Now Sign in or Sign Up if you don’t already have one. 5. In order to get Rs 100 Cashback you need to buy for minimum Rs 1000. 6. You can also use your PhonePe wallet Cash to make purchase. 7. After you get your cashback sell the gold so that you can convert it to cash. 8.The selling order will be less than of buy order so don’t worry. 9.Done. You will get your cash in your bank account. The offer is applicable on all payment modes. The offer is valid only once per Bank Account, Credit Card and Debit Card.